The devil is ever so crafty in communicating negative messages. He will do everything in his power to keep us from getting on the right train of thought. He’ll bombard our thoughts because he knows that most people don’t even think about what they are thinking about. He knows they will believe any lie he tells, that they will think any thought that comes to their minds. So we have to be committed to know, to learn, and to retrain our thinking. We have to work at believing God’s voice spoken through His Word, more than all the other voices that have spoken into our lives — including our own. Begin every day by first checking the destination board and picking the right train of thoughts. Ask yourself Where do I want to end up today? and then set your course going in the right direction. Take God’s thoughts and replace yours with His. This is the process of renewing your mind — of becoming someone who thinks, and consequently, lives differently than you do now. If this sounds like a lot of work, consider it this way: If you needed kidney dialysis every day to stay alive, you would do it, right? If you needed a pill every day to keep you alive, you would take it. 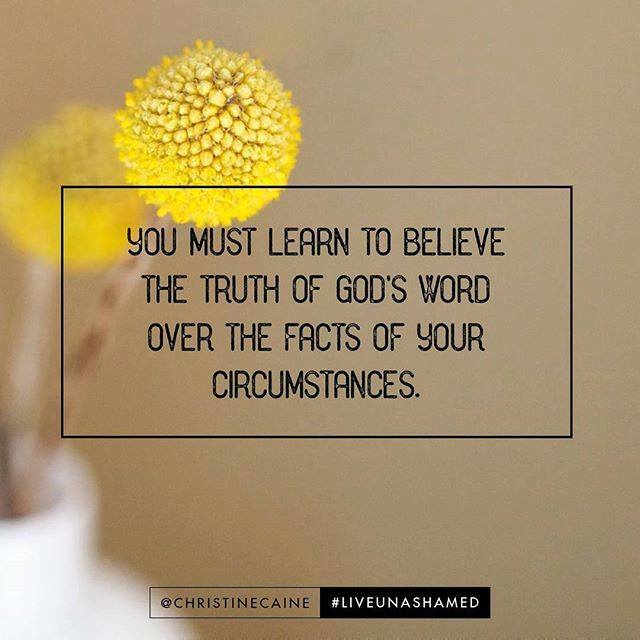 I urge you to consider it that important to study the Word. The Word will keep you on track and help you to flourish in life. Knowing who we are in Christ, and what we have in Christ, is the key to setting our course and staying on track every day. 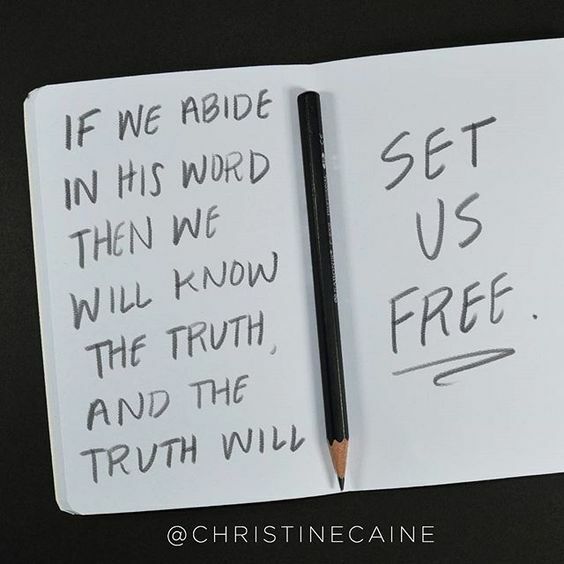 We have to think God’s truth and say it daily — because it is only the truth we know that sets us free. And the only way to know God’s Word is to read it, meditate on it, study and apply it to our everyday lives. Renewing your mind is applying the Word in a very practical way. It’s changing your thoughts — the seat of power that directs your entire life, and the way it goes. And if you’re not sure what to say — if you don’t know which train will take you there — you don’t have to just stand around waiting and hoping for that train of thought to pull up. You can go looking for it — in the Word of God. Use all the tools available to us today. There are scores of different translations and versions, accessible in a variety of print editions, on the Internet, via your smartphone, or on TV or DVD, or in countless books that provide a variety of helps — and that’s just the beginning. God is serious about getting His Word to us. We just need to be willing to apply it and reprogram our minds. When I first started renewing my mind, I had to put Post-it notes of handwritten Scriptures on my mirror that I needed to keep foremost in my mind. I kept a list of verses — passages that reminded me who I am in Christ and what I have in Christ. Post-it notes are still my best friend to this very day — because it took years to develop all the wrong thoughts. 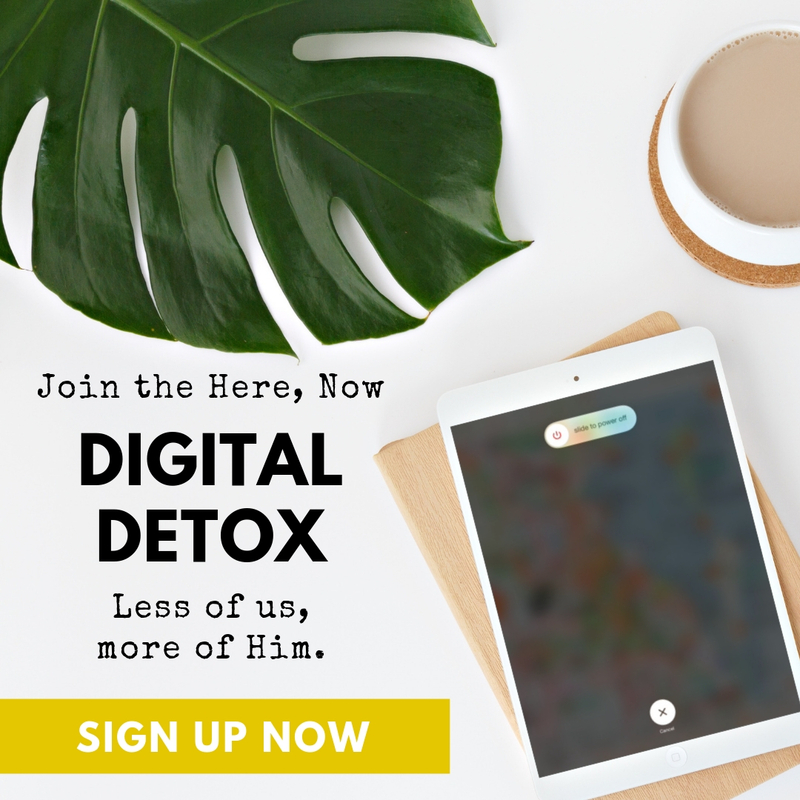 Despite our best efforts, we can’t undo overnight what took so much time to create — all those occurrences of listening to family, friends, teachers, the media, ourselves — so many voices feeding us shame-inducing thoughts. But as I committed to the process of replacing my thoughts with God’s thoughts, it has changed the course of my life. 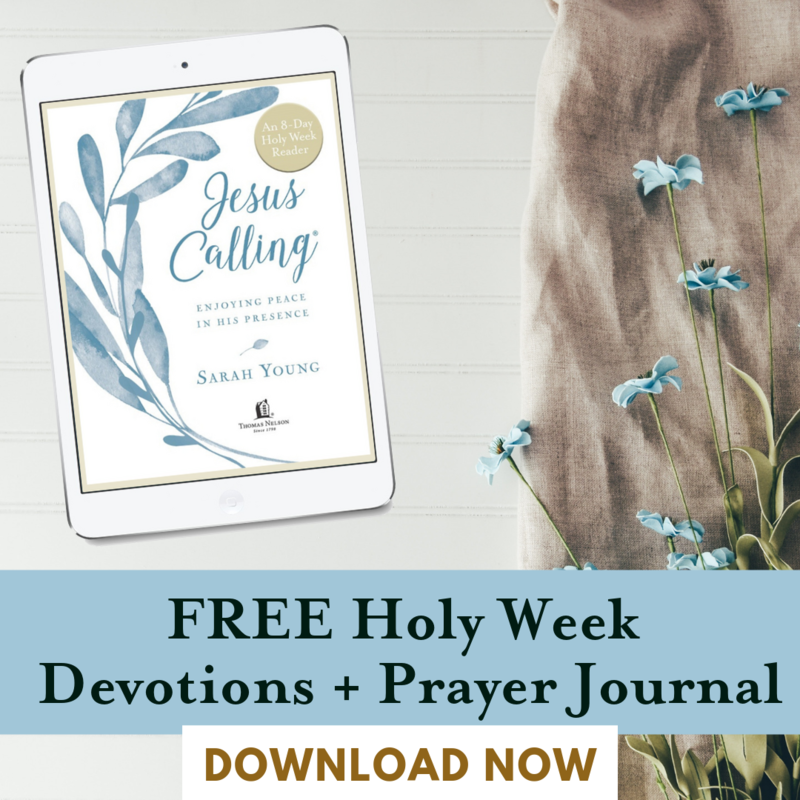 FREE PRINTABLE – Do You Need Hear and Remember the Truths of Who You Are in Christ? 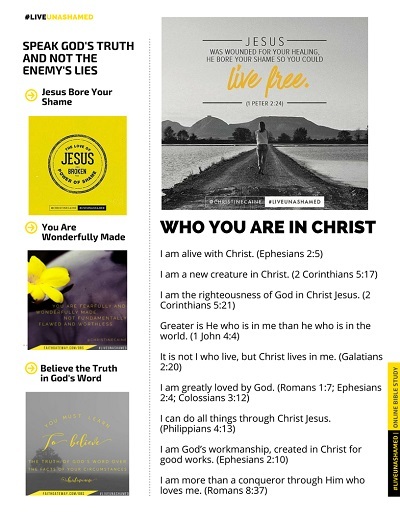 Get your FREE downloadable poster of these Who You Are in Christ scriptures to print and hang up at home, in your office, or on your bathroom mirror for daily reminders. 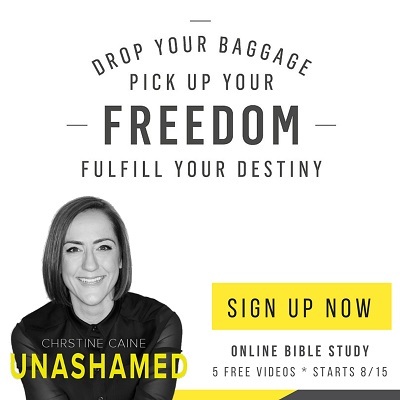 This is a free download when you sign up for the Unashamed online Bible study. When the lies come, the ones you’ve believed about yourself — fat, ugly, stupid, worthless, fundamentally flawed, failure, dumb, incapable, inadequate — take those thoughts captive. When someone is taken captive, he or she is still alive but held in confinement, contained and under control. Sometimes our thoughts will not die, but we can control them and take them captive. We have the power to intentionally quit thinking them and think new thoughts based on God’s truth. To talk back. Just last week, I wrote out eighty-five of God’s promises to carry with me in my notebook. Why, after all these years, is that still so important to me? Because when the devil is screaming his accusations every second, it’s important to counteract them with God’s voice. It really is possible to learn to think a new way. But you’re going to have to start thinking about what you are thinking about. Ensure that you board the right train of thought at the start of every day. Make conscious choices and put forth effort to reprogram your mind. Talk to yourself. I get up every day and pick the train I really want to take. I talk to myself the truth that I know, the truth that sets me free — and I jump tracks as many times a day as necessary to stay on course. Make up your mind today to set your course every morning, because there’s nothing more powerful than a made-up mind. Do you think about what you’re thinking about? Do you stop yourself in your tracks when you’re thinking the wrong things and fight back with the Word of God? Do you talk back to the devil? Today, let’s change our thinking! 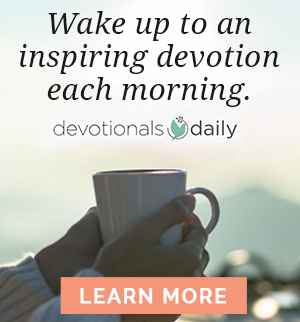 Come share with us on our blog. 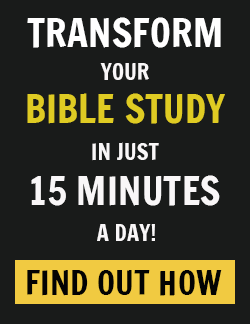 We want to hear from you about letting God, through Holy Scripture, heal our minds!